The solar surface continues “busy” with occasional sunspots as we conclude a very active December 2009. This insures that 2009 will fall several days short of the 266 blank days of 2008. This was a year with the greatest count of sunspot free days since 1913, and another indication of the deepness of the recent solar minimum. The overall solar flux continues to gradually trend upward (see slideshow below). And, there's every reason to believe the year 2010 will not dip below the low sunspot counts of the past three years. This is based on not only forecast data but the actual trends since September. Sunspot groups over the past three months have emitted more flares of greater intensity than at any other time in solar cycle 24. This is further evidence that the Sun is awakening from its extended “sunspot sleep”. In science, sometimes it’s a challenge to divorce personal opinion from what the data shows. Example: I live in north Texas where we don’t get much snow, and I think snow once in a while (not five months straight) is nice. Because of this, I have to fight a tendency to make a “wishcast” for snow in an extended outlook when the chances may be marginal at best. Having said that, I know better, and this “bias” is under control. I have noticed a similar mindset from readers of this column (constructive comments, regardless of persuasion, always appreciated; personal attacks are senseless) when I post articles on sunspots. Global cooling advocates don’t like it when I mention a new sunspot. Gee, I don’t make them. Conversely, the global warming crowd wants to debunk ANYTHING that goes against their opinions, which is also not the way science works. What do the DATA say? The year 2009 has had a very high number of days without sunspots. Sunspot activity has shown an increase since the long quiet spell of July-September 2009 (51 days in a row with a blank solar surface), but it’s certainly nothing to crow about just yet. A pronounced sunspot group helped push the solar 10.7cm radio flux to its highest level in 18 months in late September; since then, a 19-day blank streak resumed the march of sunspot-less days which now ranks 6th for any year since 1900. A weak sunspot briefly formed for only a matter of hours on October 21st ; but there’s an indication of another very minimal one forming. None of these events signal any type of dramatic uptrend in solar activity; in fact, the sun was far more active as to sunspot counts in October 2008 than observed thus far in October 2009 (thru Oct 21). A new study brings forth some interesting results amid the recent solar downturn and global climate change. During the past seven years (2002-2009) the planet’s temperature has been neutral to slightly cooler. A recent news story on the record warm oceans of July 2009 does suggest at least a temporary interruption in this trend, but the seven-year average shows no warming. During this same time, the sun’s energy has dialed down ever so slightly. The decreasing solar irradiance has (apparently) offset much (claimed anthropogenic) warming of Earth's surface. That's what researchers Judith Lean (NRL) and David Rind (NASA/GISS) say. They just published a new investigation on global temperatures in the Geophysical Research Letters, a highly respected and peer-reviewed scientific publication. 4) The accumulation of greenhouse gases. There have been 50 days in a row with no sunspots detected on the sun as of August 30, 2009. This is the 4th longest “blank streak” since 1849 and THE longest in 96 years. The current “solar minimum” has lasted about a year longer than expected and continues to defy solar physicists’ predictions. The photo here, taken by Metroplex resident Larry Alvarez, shows what is know as a "solar prominence". Essentially, it is a giant flare of superheated gas that shoots out from the sun. This illustrates well how the deepest solar sleep in 100 years is still a turbulent time for our star. However, the TOTAL flux of energy coming from it has dropped a bit. Sunspots are monitored as a time-tested method of mapping fluctuations in total solar energy output. While this only varies by about 0.2%, it has greater significance than the number suggests. Solar disturbances during high-sunspot periods disrupt satellite communications and can even cause electrical utility problems. The failure of the models to correctly predict the sun’s changes show just how much we yet have to learn about the inner workings of our nearest star. The year 2009 has moved into 8th place in the rankings of years with the most sunspot-free days since 1900. The top 10 are shown in the accompanying graph; three of these have been in the past three years. The strange transition between solar cycles 23 and 24 continues. For the first time in several months, a cycle 23 sunspot is trying to form. This further illustrates the fits and starts that the sun has experienced during its deepest solar minimum in 100 years. 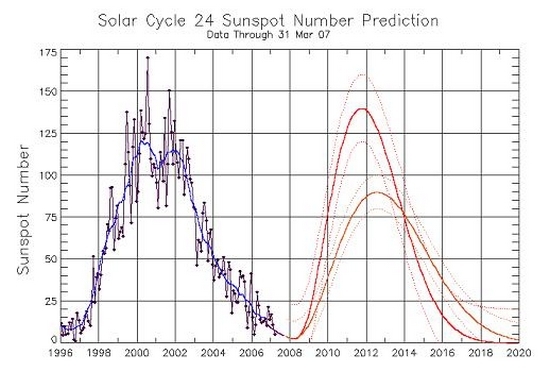 Years of study and measurement have shown that during solar cycle transitions, which happen about every eleven years (this one is a year overdue), the sunspot of the emerging (new) cycle appears at latitudes above 20 degrees while the spots of the waning cycle pop up closer to the sun’s equator. Another way to distinguish new cycle from old cycle spots is by their magnetic polarity. The new and old sunspots will have different polarity of magnetic signatures. New research led by the National Center for Atmospheric Research (NCAR) in Boulder, Colorado shows that maximum solar activity and solar fluctuations through the complete solar cycle have impacts on Earth that mimic La Nina and El Nino events in the Pacific Ocean. This research may set the stage for more accurate predictions of weather patterns at various times during the Solar Cycle, which lasts approximately 11 years.